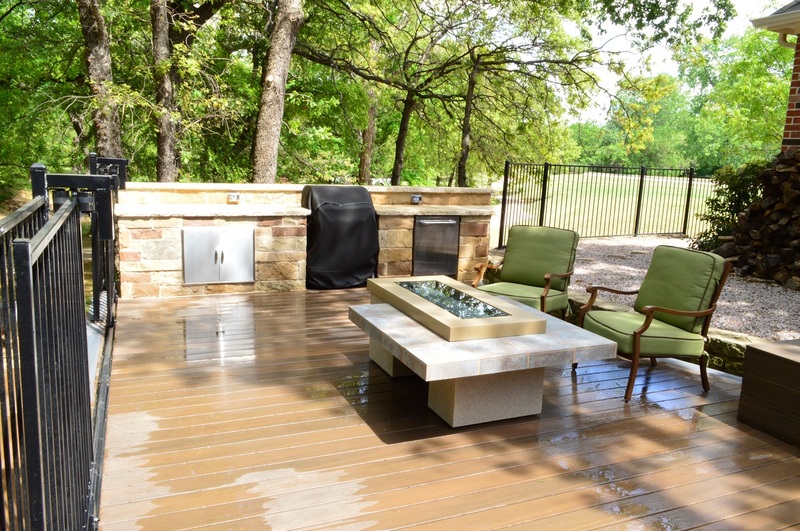 Archadeck of NE Dallas-Southlake Understands Southlake Homeowners Want the Best! You’ve got to love a city that’s sophisticated, quaint and neighborly at the same time. Add in that it’s considered one of the safest places to live in the U.S., and how could you not love it? Active Southlake families enjoy the Bob Jones Nature Center & Preserve and Bicentennial Park. Shoppers have options galore with Southlake Town Square, Park Village and Shops of Southlake for starters. When Southlake homeowners are not shopping or enjoying the area’s parks, they love relaxing and entertaining at home. Outdoor living spaces in Southlake are all-important. From open patios to covered patios to outdoor kitchens and decks, Southlake homeowners relax and entertain in comfort and s-t-y-l-e. In Southlake TX, patios are HOT! It’s true in summertime all patios may seem hot, but what we mean is that patios are quite popular in Southlake, TX. When Archadeck of NE Dallas-Southlake designs a patio for your home, we design it specifically to meet the requirements of your lot and the configuration of your home. We design it to fulfill all of your requirements because we want to build the patio of your dreams. Of all the patios we design and build, no two are alike. The stain and stamp patio is very popular because there are so many looks you can achieve with this technique. With a wide selection of colors and plenty of options for stamp patterns, you can see why each patio looks unique. Depending which color and pattern the homeowner chooses, the stain and stamp concrete patio can look high-style and sophisticated or downright casual. Add an outdoor kitchen, outdoor fireplace or seating wall and fire pit and we’ll help you coordinate, match or contrast your patio surface with your hardscape elements. As your Southlake TX patio builder, we understand if you have decided on a paver patio but have a hard time deciding which pavers to choose! With so many pavers available, you really do personalize your own patio. Once you select the main paver for the patio “field,” you can then choose different pavers for contrast either for a border or a design pattern (sometimes called a paver “rug”). Hardscapes such as pillars and retaining walls can be made of a combination of those same pavers; some paver companies offer vertical paving blocks in the same colors as the flat pavers. Was Natural Stone Always Your Preference? For some homeowners, nothing but natural stone will do. We understand the appeal, and we’ll show you a generous selection of stone types, many of which are sourced here in Texas. We’ll guide you through the characteristics of each stone, because color is not the only consideration. 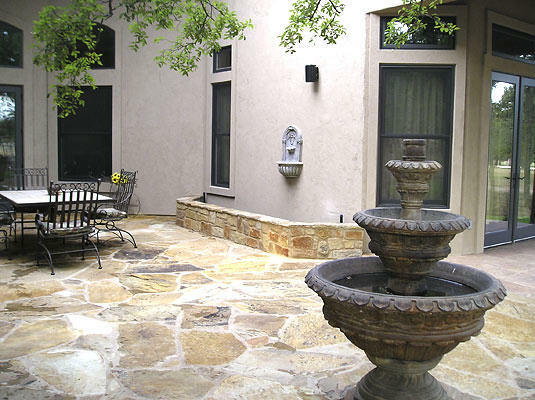 Whether you prefer flagstone or travertine or something in between, you will love this natural stone patio. 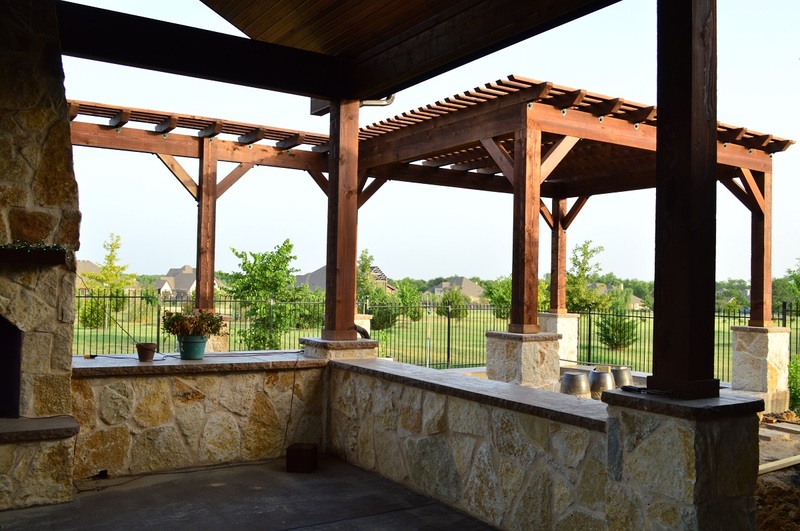 Because shade is so important in Texas, many homeowners opt for a patio that is covered or partially covered. The large patio with a portion covered and the remainder uncovered is wildly popular here, especially if this patio is poolside. Everyone needs shade sometimes! Tuck an outdoor kitchen under that covered portion and the grillmaster will not have to get burned while cooking outdoors. 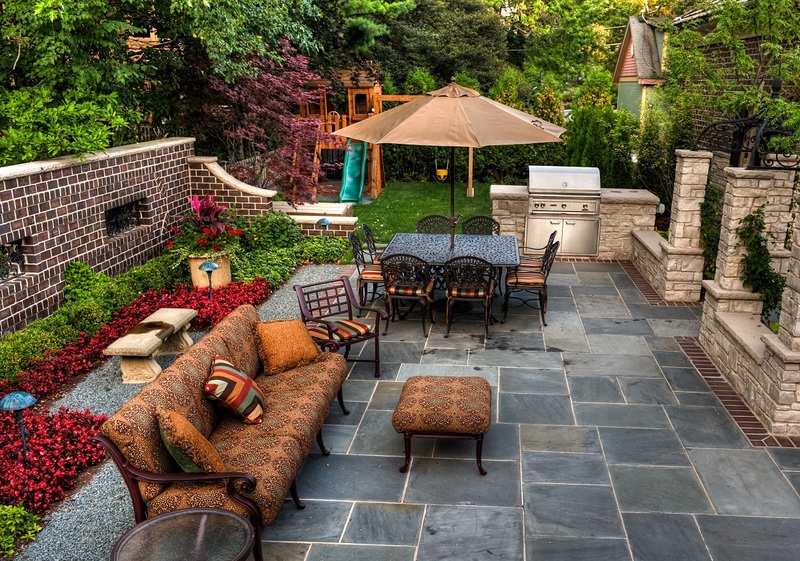 Large patios also offer room to section off part of the patio for lounging and part for dining. Add a kitchen, a bar and a TV and you’re all set for outdoor living at its finest. The world is not flat. Vertical elements such as the pergola, outdoor fireplace, fire pit, seating wall or retaining wall complement a patio beautifully. Vertical elements add visual interest to the wide, flat expanse of a patio. We can help you select the right vertical stone to match or contrast your patio style whether it’s stain and stamped concrete, pavers or natural stone. When You Want a Deck, You Should Have a Deck! With all this talk of patios, you’d think Southlake didn’t like decks at all. 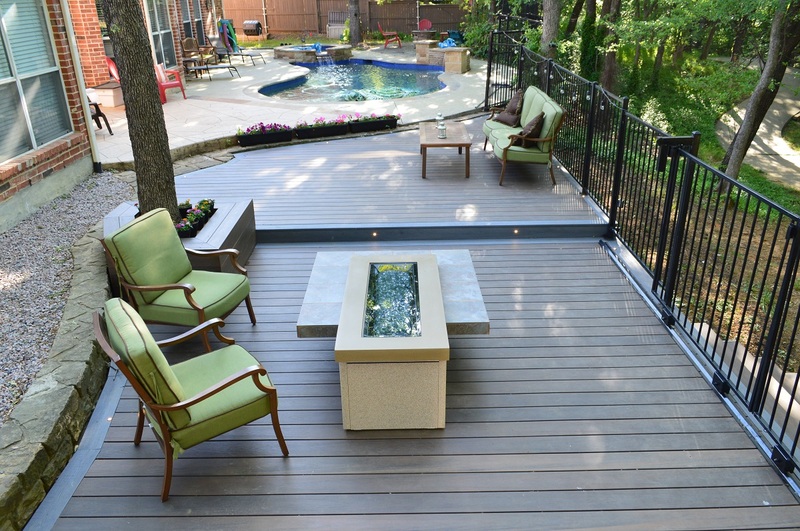 Of course, Southlake TX homeowners love decks, too! Many Southlake homes feature a deck-and-patio combination, with each structure serving a specific purpose in the outdoor living space. If you have a covered patio poolside, with an outdoor kitchen in the covered portion, you may want to lounge on a deck that’s open to the warmth of the sun. You choose! Here’s one of our favorite Southlake projects (okay, they’re all favorites) where a patio surrounds the pool and leads to a deck with a fire table and outdoor kitchen. These areas can be used as two separate spaces or, for entertaining a large group, they can function as one continuous space. 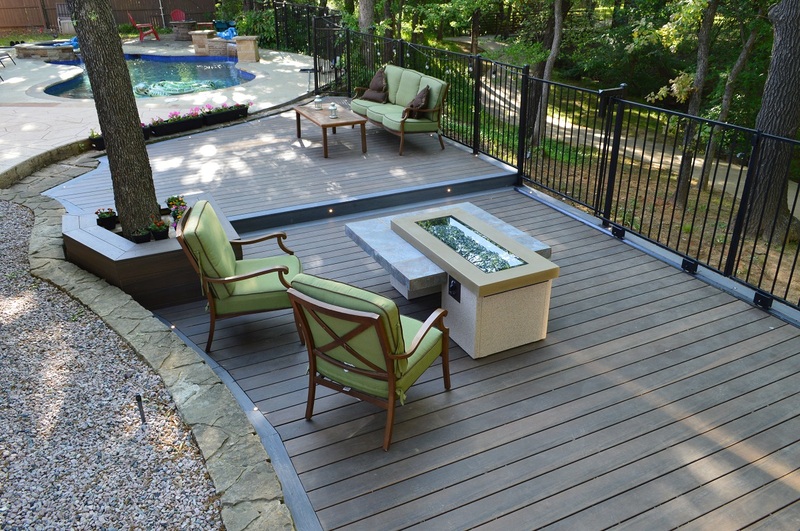 If you’re considering a deck as part of your outdoor living space, we can help you navigate the choices of decking materials including wood or low-maintenance composites and synthetics. 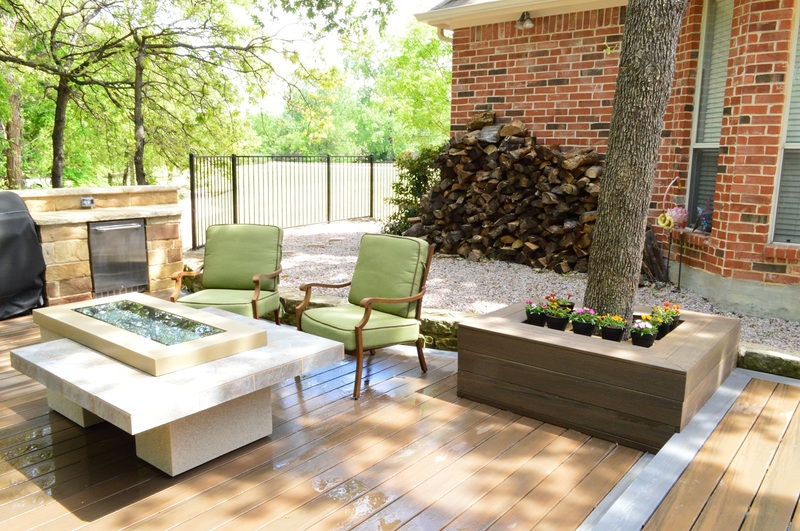 A deck can be partnered with an outdoor fireplace, fire pit or outdoor kitchen, too, so don’t think you can only add these elements if you have a patio. 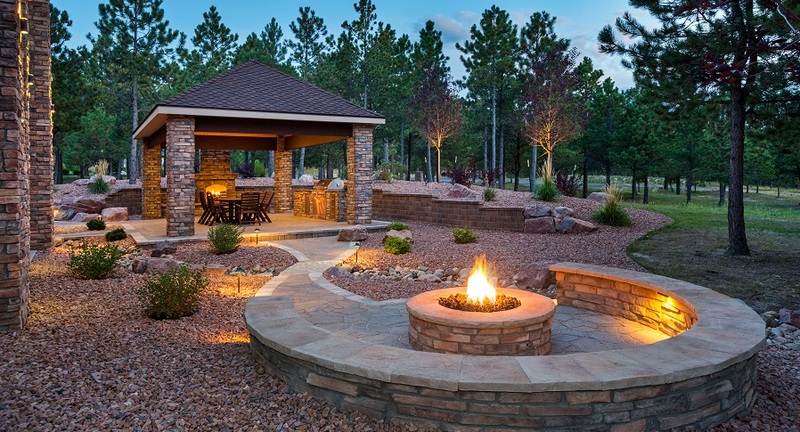 We can mix and match any of these elements to create the outdoor living space you have been dreaming of. 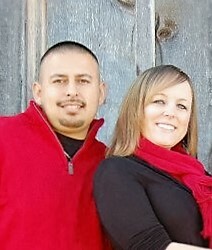 Contact us today for a design consultation for your Southlake TX patio, deck, outdoor kitchen, fireplace or fire pit. We can design the perfect combination of the elements you choose. Contact us today at (972) 904–3325 or email us at [email protected]. Stone Lakes, Stratfort Gardens, Timarron, Timber Lake, Versailles, Westwyck Hills, Wimbledon Estates, Winding Creek, Wingate Hill and many more!